Use the Board over and over to reinforce beginning Maths facts. 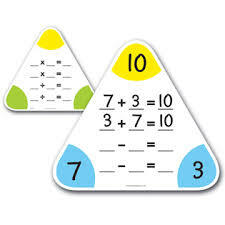 Build number fact fluency with this double-sided, wipe-clean board, designed in the familiar triangular format. It features addition/subtraction on one side and multiplication/division on the reverse. Support algebraic skills such as equations and problem solving. Boards measure 25cm H x W.
Use with Wet-Erase or Dry-Erase Markers.